After purchasing that dream home, every homeowner wants to decorate their new investment. This often includes lavishly decorated tree houses, beautifully grown gardens, and ornately built water fountains. 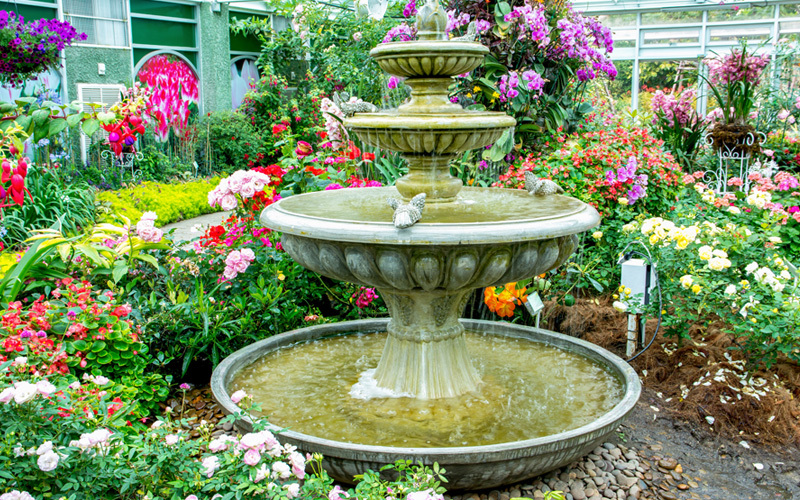 Every homeowner should add a fountain to their garden according to three important classifications, which are style, function, and size. Select a fountain based on the overall look of the fountain. They want the fountain to to be aesthetically pleasing. 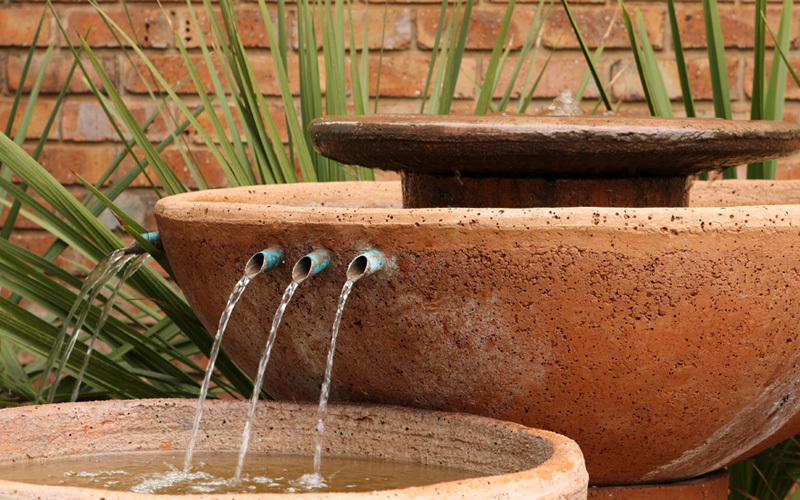 Garden water fountains add an extra layer of appeal to a home. 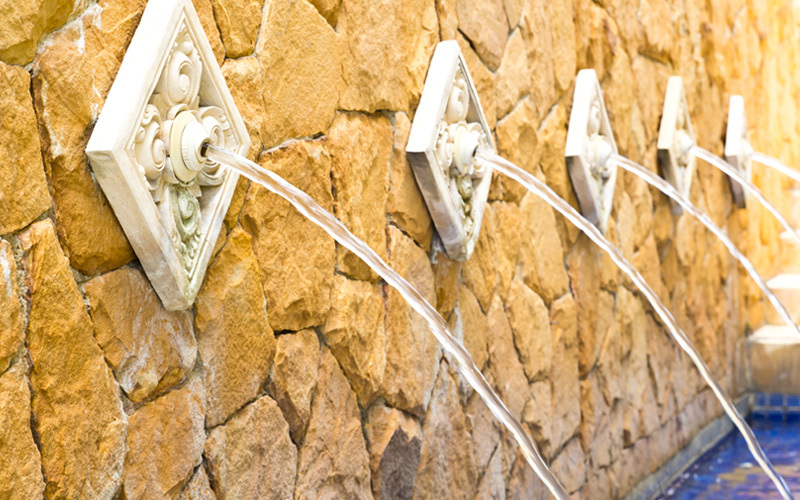 Homeowners select water fountains based on what they do and how they will serve the home. Perhaps the homeowner wants water to squirt in a vertical arch instead of a steady waterfall down onto a pool of rocks. 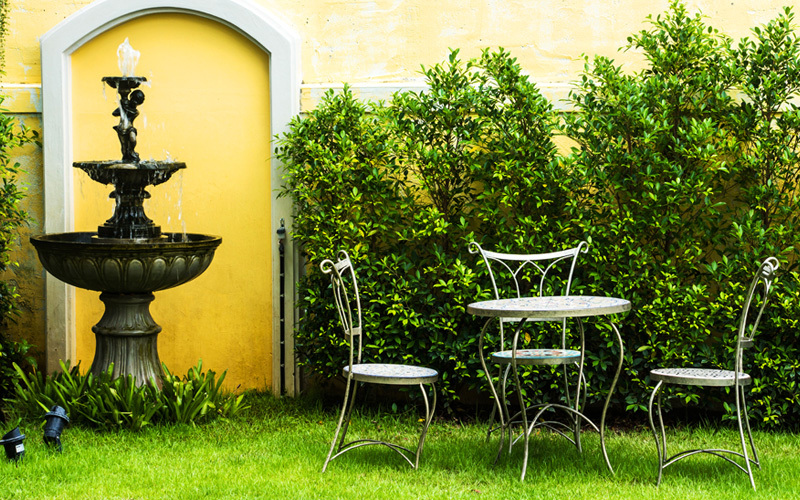 The third most important classification that every homeowner needs to consider is the size of the fountain. 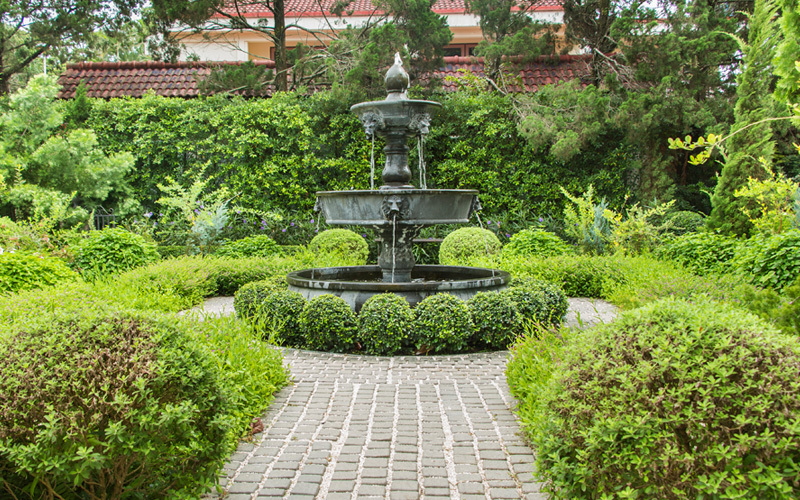 Depending on the size of the property and, consequently, the house, every homeowner needs to consider the size of the fountain. 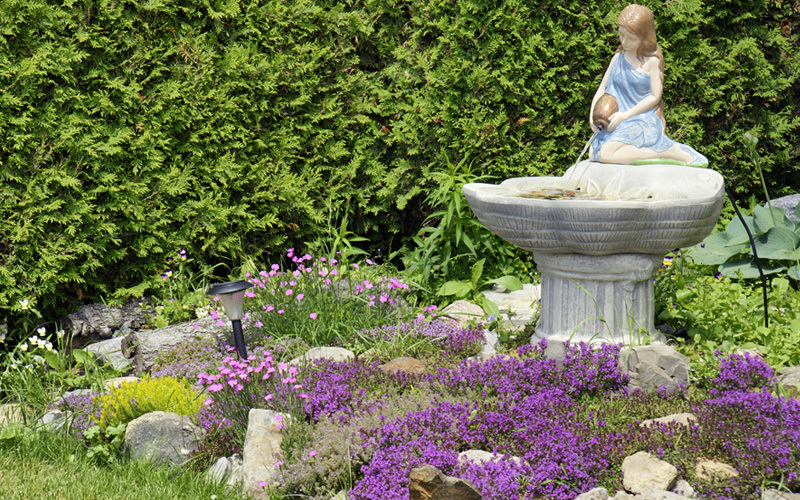 Does the homeowner want a small stream of water surrounded by rocks or a large pool of water that has a fountain in the center of it? 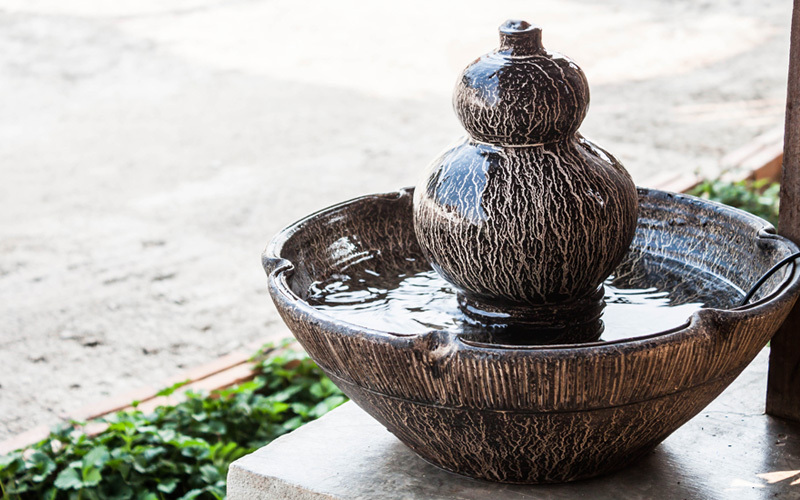 Style, function, and size are important qualities to consider when selecting that dream garden water fountain for that perfect new dream home. 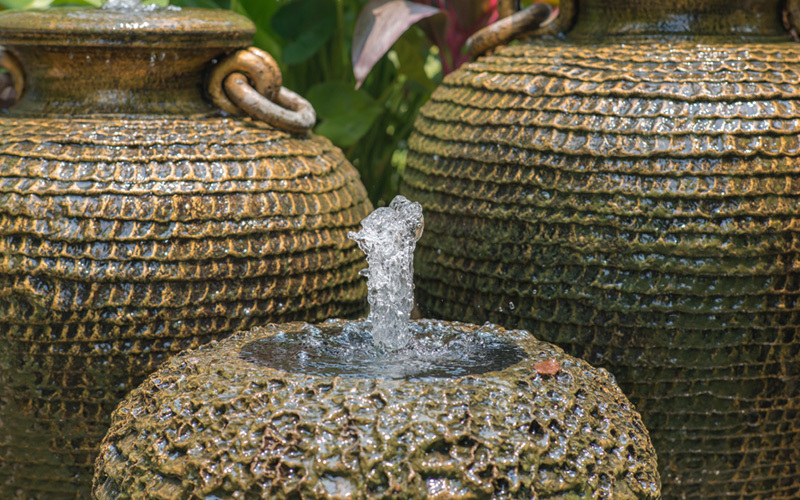 Once these three qualities are met, the homeowner has a fountain that they can treasure for decades. 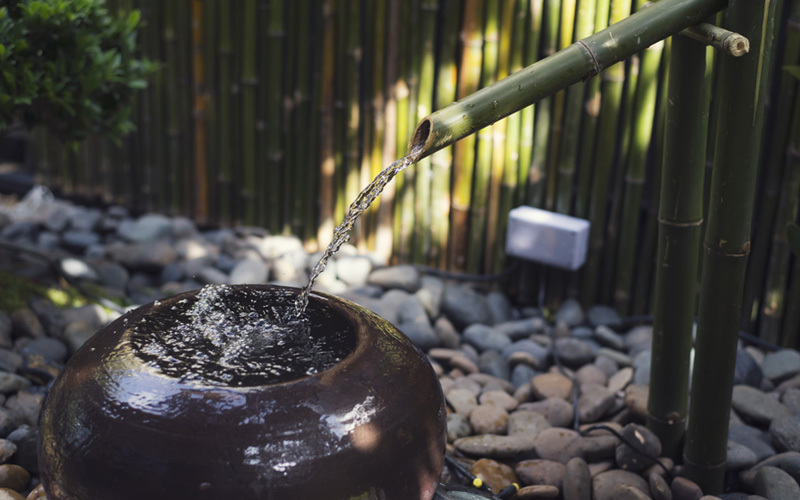 The following are fifteen of the best garden water fountains. I chose them based on style, function, and style. My favorite addition to any garden water fountain is an outdoor sitting area for the family, but with a bigger fountain. Bright floral surrounds a water hole, which has been artfully created to have water flow upwards creating a rippling effect. The water hole is surrounded by rocks, which are covered partly by green moss, going for a very earthy look. A line of ornately decorated vases runs through this garden. Fresh, spring water shoots out of the top of the vases, which have been painted with the colors black and gold. This garden is constructed by bamboo trees. There is a bamboo fence on one side and a water pump that is made out of bamboo. The water pump pours out water in a steady stream into a giant bowl. Three ornately decorated vases are positioned in a triangular position. These vases are textured, creating a complicated and unique pattern. 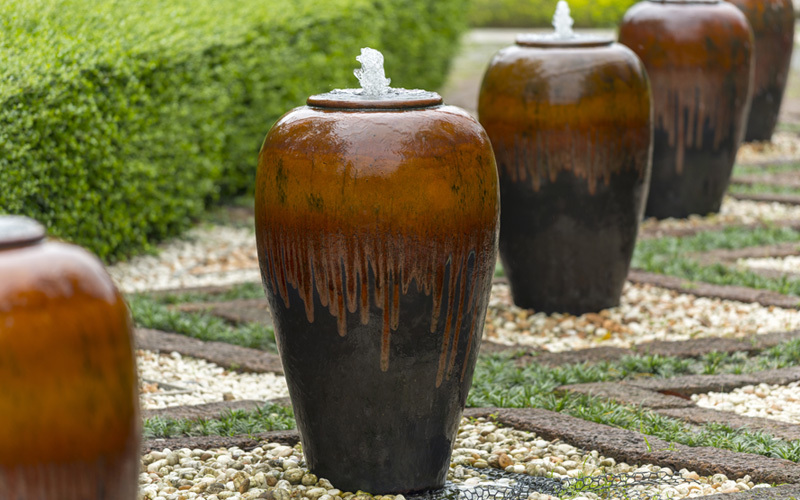 Clean water pours out, creating a small stream of water at the top of the vases. A giant man-made pool sits in the middle of a park. The pool contains green colored water. There are several giant rocks in the pool. The pool is contained by a circle of stones, carefully and intricately stacked on top of each other, creating a man-made pool. This is a large open space full of greenery from green shrubs to beautiful floral to benches made out of stone. In the middle is a circle of cement, in which a stream of water jet upwards. A wide-brimmed, textured bowl is filled with clean, clear water. A rotund figure sits in the middle of the bowl. Water surrounds the rotund figure. This tiny fountain sits on the corner of a concrete shelf. A concrete fountain sits on a lush green hill. The fountain is capped at the corners by cement cinder blocks. A metal tube stands poised over the fountain pouring out water in a steady stream. The fountain is filled to the brim with water. A wall of stone is the centerpiece of this garden. On the wall are ornately shaped diamonds lined up in a straight line. Complex patterns are carved inside each diamond. In the middle of the diamond, a stream of water jets out onto the ground. This garden is surrounded by lush greenery. There is a brick road that leads up to a giant water fountain. The water fountain is made out of stone and is comprised of three levels. On the top and second level, there are lion heads carved into the sides. Water shoots out of the lion’s mouth. 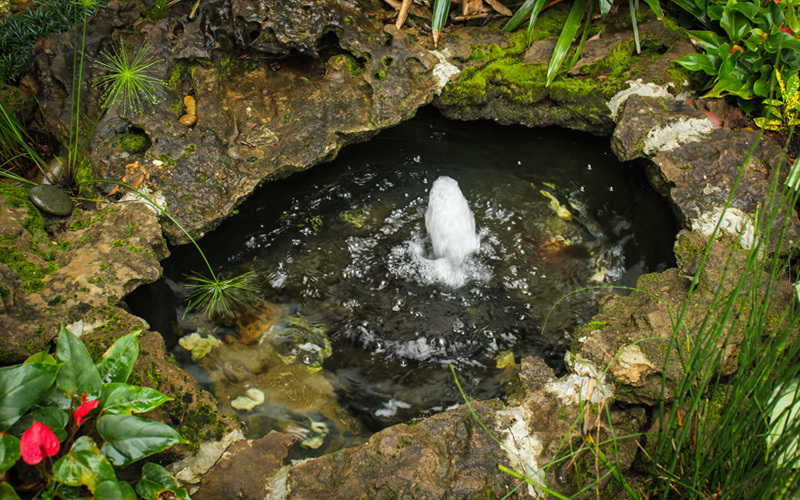 In front of a thick green brush, there is a small white fountain. An angel in a blue dress sits on top of the fountain, pouring water out of a brown vase. The fountain appears peaceful and full of hope, as the angel blesses the water. There is a huge stone bowl of water. Multiple pipes stick out from the bowl, pouring water into a smaller bowl. Three small streams of water pour out. These bowls transfer water seamlessly. 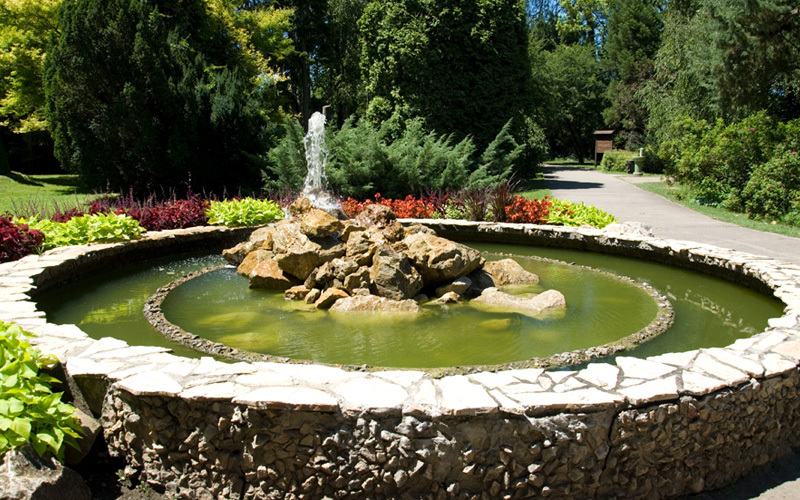 A large ornate fountain stands on top of a rectangular pool of water. The pool contains clear, green water. Water is filled to the brim of the fountain. Water streams out of the fountain and down into the pool. There is a dark fountain centered by a baby statue, which hold a torch of water. This torch pours water down the fountain in a magnificent stream. A table and chairs stand by the fountain. 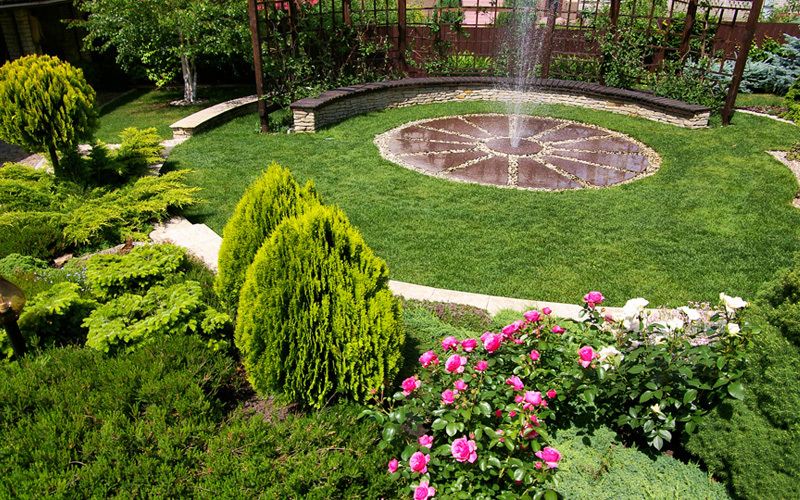 It is a perfect setup for a family wanting to sit and enjoy the fountain. 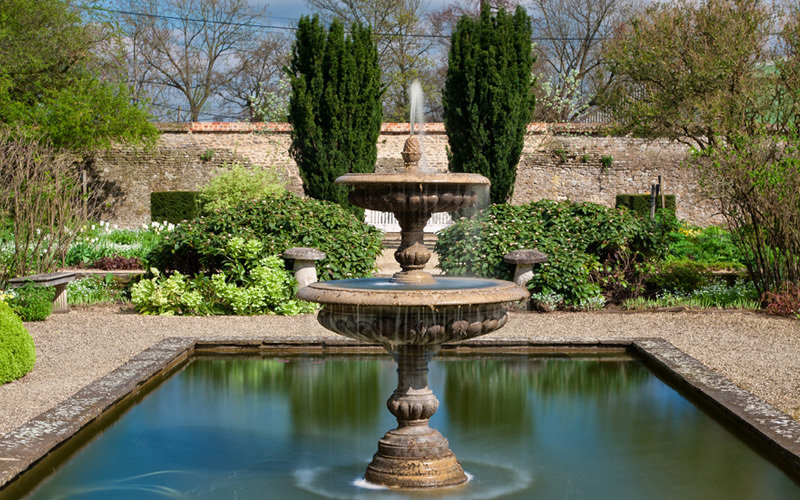 These fifteen fountains all perform the same function but are different in style and size. 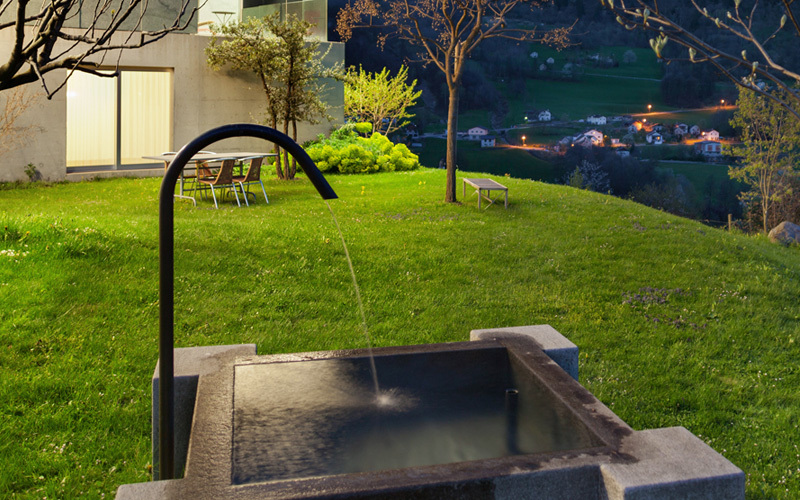 You can choose the fountain that best suits you and your lifestyle. Which fountain did you like best? DId you enjoy reading about these fifteen fountains.